21 July 2010 A talented young drummer, dancer and actor with Down syndrome, a woman considered the "glue" behind the successful art programme at Auckland Prison, an arts centre for people with experience of mental ill health and a community partnership fostering intergenerational creativity were recognised tonight at the Big âA' Awards 2010, presented at Parliament by Arts Access Aotearoa. • Enliven Longview Rest Home, Society of St Vincent de Paul and Vinnies of St Francis Xavier School, and St Francis Xavier School, Tawa, Wellington, awarded the Big ‘A’ Community Partnership Award 2010. The annual Big ‘A’ Awards are the only awards in New Zealand celebrating the outstanding achievements of individuals and organisations working to enhance the artistic lives of people who have been marginalised by the mainstream. They also recognise a talented young artist who faces barriers in pursuing his/her artistic career. Marianne Taylor, Executive Director of Arts Access Aotearoa, said the Big ‘A’ Awards pay tribute to the often unsung heroes providing artistic opportunities to people with limited access. In his keynote address, Mr Finlayson spoke about the way in which the arts can cross cultures, faiths, generations and languagues. “However,” he said, “the arts cannot cross boundaries while significant barriers remain for a significant sector in the community. Mr Finlayson presented two of the awards. 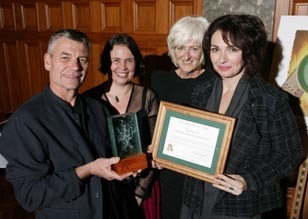 The Big ‘A’ Winton and Margaret Bear Young Artist Award 2010 was presented by the 2009 recipient of the award, writer Mary Dennis. 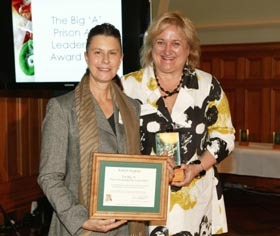 The Big ‘A’ Prison Arts Leadership Award 2010 was presented by Alison Thom, Rehabilitation and Reintegration Manager, Department of Corrections. 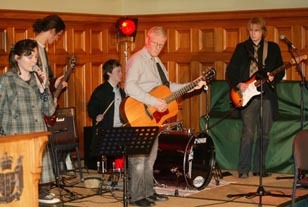 The evening also featured performances by Te Rakau Hua O Te Wao Tapu Trust, and Duncan Armstrong and his band. Artwork by prisoners studying visual arts through The Learning Connexion in Lower Hutt was on display. Arts Access Aotearoa is the national voice for artists and communities that have been marginalised by the mainstream (e.g. refugees, mental health consumers, disconnected youth, senior citizens, the justice sector, disabled people). Working in partnership with individuals and organisations, it helps ensure New Zealanders have access to the arts and can create, perform and develop art projects. Arts Access Aotearoa receives major funding from Creative New Zealand and the Department of Corrections. Original generation time 1.4402 seconds. Cache Loaded in: 0.0004 seconds.